People in the streets are buying flowers and sweets and they are exchanging cards. They are trying on costumes and before long fireworks will be exploding in the night sky. Everyone knows that soon it will be Chinese New Year, or Spring Festival. This holiday is held every year in January or February when there is the first new moon of the year. The holiday lasts fifteen days but preparations begin long before the night of the first new moon. Many people begin by holding a ceremony which they hope will placate the Kitchen God so that he will give the Jade Emperor a good report about their family. Then they clean their homes and decorate them with flowers. Next they buy some new clothes and get a haircut. Then there are numerous delicious dishes to prepare, each one of which is symbolic of some aspect of the New Year. Noodles symbolize a long life, while dumplings “bring riches.” Best of all, these special dishes bring families and friends together for a feast on the day before the New Year. Once the meal is over families talk together and share memories. Then at midnight the fireworks begin. It is said that loud noises scare away monsters and evil spirits. And this is just the beginning! All kinds of parades, firework shows, prayers, feasts and special events take place in the days to come. People give gifts to friends and family members. Chinese New Year concludes with the Lantern Festival on the night of the full moon. 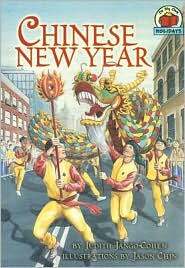 This excellent title will give young readers a fascinating picture of what to expect during a Chinese New Year celebration. Not only are numerous customs described but the author also tells her readers how some of the traditions came about. This is one of the titles in the “On my own holidays” series.